Whilst as a collector I have a preference for mechanical watches (to see a watch movement in operation I find utterly fascinating) I have to admit that as many other folks I tend to wear a Quartz digital watch for everyday use. And for good reason I suppose as apart from accuracy, they are much more resilient when it comes to physical abuse of modern living such as sports like swimming or golf etc. Just a selection of Quartz watches that demonstrate the fabulous choice of amazingly low priced models available today in the market. Note that in the image I have highlighted Casio who are in the forefront of this extraordinary treasure trove of affordable watches. I make no excuse for that as they and others offer such a wide variety of different styles and features and at such incredible prices. In this montage here I’ve also included a couple from Sekonda, the British manufacturer who topped the UK sales for brand in 1998 and still up there and also there’s a Swatch watch in there who produce some wonderful “cult” design watches at affordable prices too. Probably it’s these manufacturers we have to thank for giving and that’s almost the right word – giving us the opportunity to own, what is an often taken for granted marvel of miniature electronics. There is no doubt that the Quartz revolution has given us so much. There are of course many more around but just scratching the surface it is evident that the days of the cheap watch are very much with us – and I don’t mean cheap as poor – very much to the contrary. These watches are tremendous value, they do what they say on the box, their reliability is amazing and the range is unreal – there must be virtually something for everyone. For a plain tell the time watch these are around £10 – £25 and with day date window £20 – £30. For chronograph functions £15 – £40 is possible and you can find multi-functions £40 – £90. Of course the sky’s the limit but it is amazing what you can get for not a lot of money. So often when considering a new watch we end up setting out sites on that “expensive” new watch, whether it be a “mid range” or indeed a “high end” model, we each cut our cloth to suit. However it is very evident and no more so when I seek a pre-owned vintage or high end mechanical classic watch that many folk simply don’t look after their watches at all! Slung in a drawer somewhere along with keys, pens, paper clips and goodness knows what else, they often end up with badly scratched cases (in many instances these were gold for goodness sake), scratched glass, hands knocked off and often with dampness into the dial and movements – it’s a wonder they bought a decent watch in the first place for all the care they’ve taken over them. 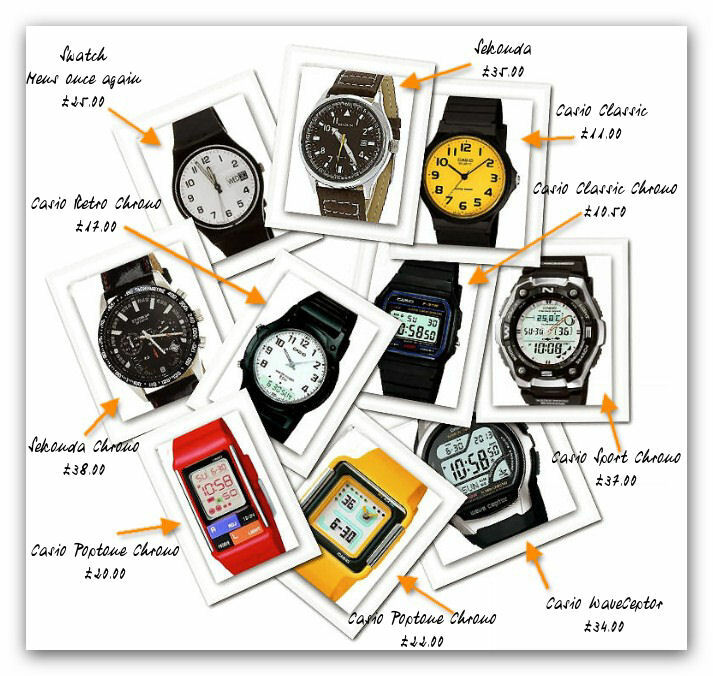 So this wonderful diversity of really low priced watches should be an absolute winner – if they get scratched or damaged – who cares? – at these prices simply get another one. And one thing is absolutely certain – Quartz – is the bargain of today and there’s an awful lot of them!